To keep up with it, you have to read. But what books should you read? Also, in what order is a question that a difficult to answer. It is impossible to read all the thousands of books that are published each year. has the information you want so you don't waste your time. But, the quality of these reviews varies from writer to writer and today we're going to show you a systematic way to write a review. This makes the entire process much simpler and allows the review to be better quality and more use to those who are attempting to wade through the sheer volume of computer books being written today. So, when you're finished reading this article, you'll be able to write reviews much quicker and with better quality than ever before. But, to do this, we have first to look at how to read the book. The other books that are informative and talk about new advances are usually more interesting as the author is excited about the topic and wants to share all that they know. Therefore, as you can see your review needs to reflect what the author has in mind, as it will shape the content of your review. On the first pass, we are only interested in building a model of what the book is about and its structure. To do this you need to first look at the cover of the book. Note the title, author and any other pertinent information that might help you understand what the book is about. Book covers today attempt to give you all this information in small word bites in an attempt to entice you to buy the book. On the back cover as there should be a short synopsis of what the book is about and what benefits you will derive from reading it. Jot down any keywords that you see, as they will useful later when you're writing your review. Look at the chapter headings in the table of contents. This is where the author gives you the skeleton that he's going to hang his thoughts and ideas onto. Again, jot down notes. this particular book. So, this is where the table of contents helps you write your review better. actuality is a listing of all the main thoughts and the ideas for the entire book laid out for you. Our language uses filler words to connect the various ideas and topics together. The index is the actual listing of the key concepts that the author is trying to get across. Using a highlighter, you can mark key thoughts that you want to hit upon in your review and be able to find them quickly later. about 10 to 15 minutes. You are building up in your mind a picture of what the book is about. Do books properly you need to be able to read at a slow speed as well as a high-speed. Taking the Evelyn Wood speed-reading course or the Photo Reading program written by Paul Scheele would be of great benefit. However, whichever method you decide to use read the book from cover to cover highlighting keywords and concepts. Yellow Stickier or Tab Indicators can be used as mini book markers to help you find this key information later while writing your review. Using different colour highlighters is another good way to differentiate key concepts by their importance and relevance. to have a lot of table space or a large open room to be able to sort through your notes. Yellow stickier were used as well but require a large whiteboard or an empty wall. The book review should be short. A programmer doesn't have time to read "War and Peace"
so your book review should be between 500 and 1000 words. This could be a daunting task. Therefore, this means you have to do a synopsis of the key ideas that the author is conveying in his book. One trick you can do is taking the book cover synopsis and uses it as the basis of your review. From there flesh it out with the key concepts that you feel that the readers of the review would be most interested in. Again, Scrivener can help you keep honest by monitoring your word count as you write. Use headers to identify the various the thoughts of your review. Organize them in a logical manner and at an introduction, conclusion, and you are finished. Remember to use the table of contents as well as the index to extract programming keywords you think are critical to the reader of this particular book. 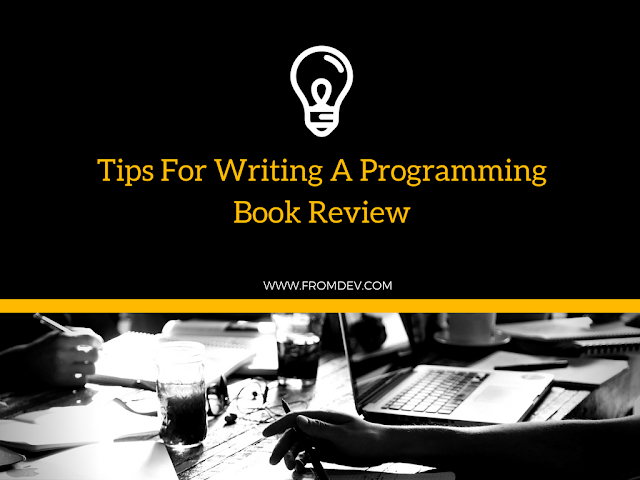 Writing a Programming book review does not have to be difficult. If you follow these simple steps you can get through your book get the information you need and create one that conveys the programming related information and answers the questions that the program wants to know and your opinion of how well the author delivered his message.